West African national cuisine. 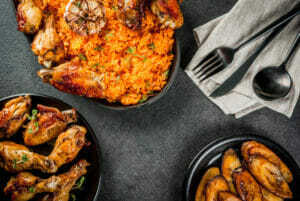 Jollof rice with grilled chicken wings and fried plantains. In a blender, add a cup of water and blend the tomatoes, 1 onion bulb chunks, hot pepper, red bell pepper or tatashe, garlic and ginger till it forms a smooth puree. In a small sized saucepan; boil the tomato puree until the excess water dries up. In a medium sized saucepan; heat up the oil and fry the diced onions for about 5 minutes. Then ddd the fresh tomato puree and fry for about 5 to 7 minutes mins; add the the tomato paste (if you are using), fry for another 5 minutes. Season the sauce with the curry, thyme, seasoning cubes,salt, pepper and jollof rice spice. Fry for another 5 mins or until the oil is completely separated from the tomato sauce. Add the the washed rice and chicken/beef stock or water.Reduce the heat to the lowest level e.g 2 or 3. Stir properly and cover with a lid. Serve with plantains, beef, chicken etc.